A journey to the postcard. 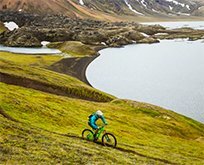 Time well spent: 3 days of great singletracks from Reykjavík to the highlands. Super flexible setup with a private superjeep that brings you to carefully chosen singletracks. 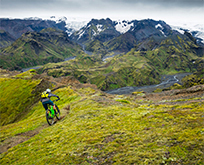 Black lava, canyons, waterfalls and the colourful Rhyolite mountains provide a stunning ‘postcard-perfect’ backdrop that frames each day of perfect riding. As a bonus we soak in the natural hot springs – it would be un-Icelandic not to. Advanced to Expert skill level! This best selling trip is for the advanced AM / Enduro rider with some true grit. Exploring Iceland’s rugged and magical backcountry terrain around nature reserve Fjallabak and Þórsmörk area including the best parts of the famous Laugavegur trail. 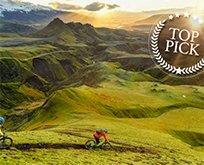 This awarded Icebike trip explores Iceland’s best singletracks. 1 day heli-biking. 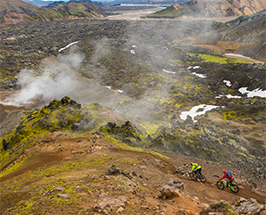 This new version of the Raven trip is geared toward the intermediate XC rider, bringing you far and wide to experience Iceland’s understated splendour. Riding the lower mountain trails and gravel roads in reserve Fjallabak and Þórsmörk area around the famous Laugavegur trail. 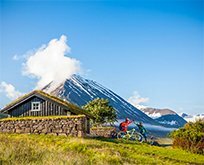 Trip for advanced riders: A 3 day trip where we ride in the powerful dormant volcanic area of Thorsmork. Surrounded by glaciers, this trip delivers nothing less than spectacular scenery. Ride numerous high mountain passes and flowy single tracks leading from summit to sea shore. The mountains of the Troll’s are Iceland’s highest outside of the central highland Icecap area.